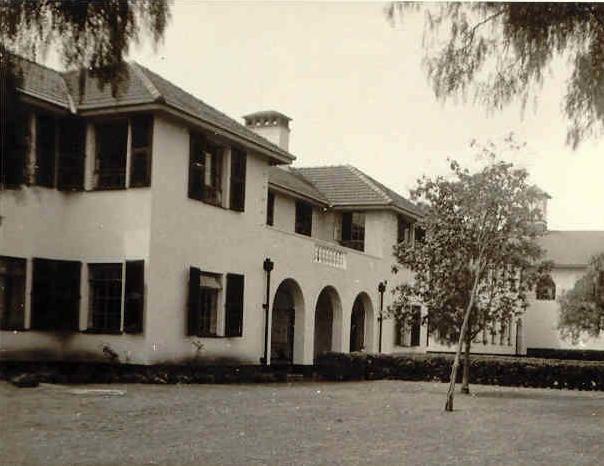 Stella went out to Kenya age six in 1928 and lived on a farm in Kitale. She went to Loreto Convent in Nairobi. Karibu - which is the Swahili word for 'Welcome'. In fact it is much more than that - it means near to. It is the Swahili word which I believe sums up Mum with her very stoic personality. Asanti sana - Swahili word for 'Thank you'. I know that Mum would be very pleased and touched by the number of people here today. Lucy Mary Estelle McFarnell nee Thomson - Mum was born on 5th July 1922 in Norfolk, England. At the age of six her father Major Thomson purchased a farm in Kitale, Kenya and the whole family moved to Africa. 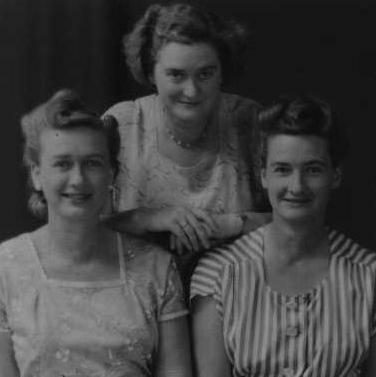 Mum had 2 older sisters Pat and Gill and she joined them at the Loretto Convent School in Nairobi. Mum completed a secretarial course when she finished school. David was born June 1944 in Kitale, Kenya. After the war, Mum and Dad went to South Africa and I was born in Germiston, April 1946. They returned to Kenya in time for Jean to be born in February 1948. 14 years later my youngest brother James was born in August 1962 in Narobi, Kenya. In 1963 the family settled in Beckenham, Kent and this included Gill and Granny. People were always welcome at Downs Hill and when any one extra turned up, Mum just added another roast potatoes. Bob Moule a friend of Dave came to lunch and he stayed for 5 years before going out to Australia with Dave. In 1977, The family of Mum, Dad, James, Gill and Pat moved to Dover. The Sunday lunches were very important to Mum and these continued through until she went in 2000 to live with Jean in Salisbury. This tradition is now carried on by the next generation. A telephone call replaced the Sunday lunch but I know her 85 birthday party was very important to her because so many of the family were able to travel to Salisbury. 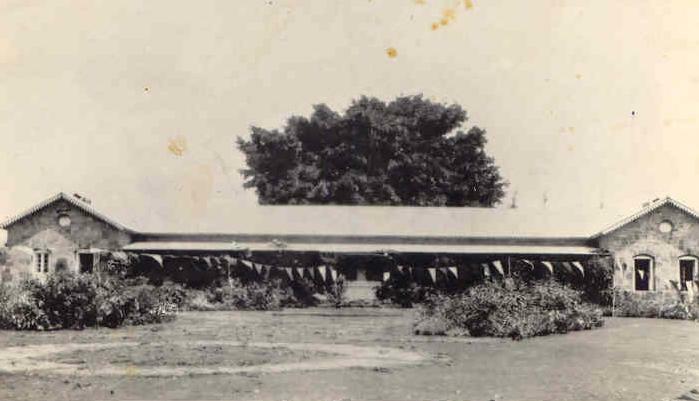 For the whole family a Christmas holiday in 1954 at Shamoni, Mombasa was a very treasured memory. My wife Anne and I had talked so much about Kenya but it took our daughter Charlotte to get us to go and our hotel was very near that beach. On the day Mum died I had taken a video of her office in Mombasa where she had worked as secretary to the Town Clerk and that gave me some comfort, although I was nearly arrested for filming a Government building. I had taken lots of video to show her but hopefully she can watch from up there, reunited with Dad, Pat, Gill and Granny. Kwari Mum - which is the Swahili word for 'Goodbye' We celebrate your life, we remember your love for the garden and the birds. Watching countdown and completing the daily crossword and so much more. There are now just 12 Mcfarnells in the World. 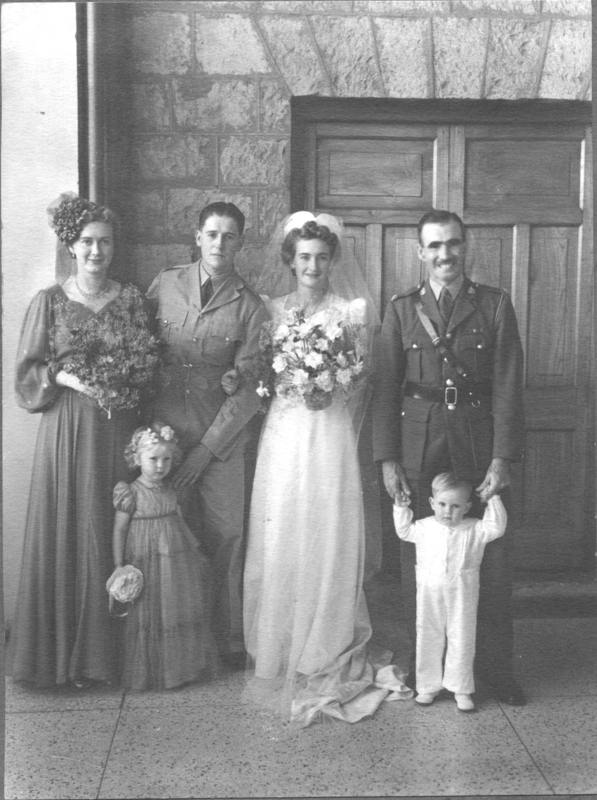 On 26th January 1942 Mac married Stella at the Holy Family Church in Nairobi. Stella wore a beautiful Tudor gown of ivory brocade with a long train; A Tudor head-dress held her long flowing veil. Major Stewart was best man and Pat ( Stella's eldest sister ) was Dame of Honour, wearing a lovely blue chiffon dress with silver spotted sleeves and a flower hat. Alice Luck was the flower girl and her brother was the page boy. Alice was wearing a Victorian frock of blue net with a flower head-dress and carried a sweet pea posy while her brother John was in a trim white satin suit. The reception was held at the New Stanley Hotel, where the guests were received by the bride's parents. Mac and Stella left on their honeymoon amidst showers of confetti to stay at Brackenhurst, Limuru. Stella looking charming in a powder-blue dress with a mulberry coat and hat and mulberry-red accessories.